Buyers of paandaans have dwindled over the years due to changing traditions. Hyderabad: It’s a hot summer afternoon and the narrow streets of Jahanuma Lancer in the old city are quiet and deserted. 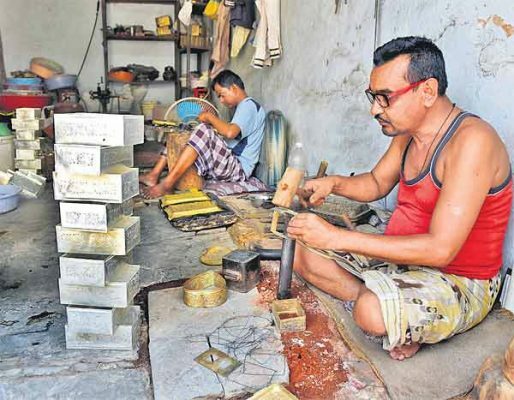 In a tiny room in the locality that once was home to the army of Paigah Royals, 55-year-old Syed Siddiq Ali is busy polishing metal boxes of various shapes and sizes. One after the other, Siddiq takes the box and rubs polish on it. “This is paandaan (metal box to store betel leaves). After several days I got an order from a wholesale trader as the season of Muslim marriages will begin soon after the month of Ramzan,” he says. In fact, a complete paandaan set comprising a paandaan – a metal box with space to keep paan, supari (betelnut) and other ingredients that go into the making of a paan; nagardaan (a heart-shaped box in which a paan in placed), supari dabba (betelnut box) and ugaldaan (a receptacle for spitting). Several families in the past had a complete set at their house with elderly women and men chewing paan at regular intervals. In fact, visitors were offered paan made at home itself as the paan shops came much later into the picture. Later however, the paandaan set got reduced to a gift to be given away during a girl’s marriage. “Buyers for the articles have dwindled over the years. In marriages, people are gifting some other articles to their daughters instead of the traditional ones as nowadays fewer women, with even some elderly persons, giving up the habit of chewing paan,” says Siddiq. A few families who still possess the paandaan sets bring out these during festivals or marriages and get them repaired or polished, he reveals. Making the paandan set is a big task and takes around six to eight days. The first step involves cutting the brass metal sheet and then giving it the desired shape of the container. Next, they polish it and later assemble it. “People in four different workshops take up the job. Every set requires skilled men to do it,” says Siddiq who along with his family makes paandan sets. He also makes attar dan (attar box) and surme dani. Only during the month of Ramzan there are regular sales of attar box. “Otherwise, we get orders only for marriages from the districts of Telangana, Karnataka and Maharashtra,” he points out. With the orders coming down and drop in regular work, not many youngsters are taking to the craft. “The last decade has brought about a lot of changes. People are not seriously hooked to traditions and due to this, several crafts associated with the traditions of yore are passing through a bad time. With hardly any earnings left in the trade, we ourselves are not encouraging our children to take up it as a full-time work. After a few years we may not find any work,” laments Siddiq.